The 2TB Desktop Performance 7200 rpm SATA III 3.5" Internal HDD Retail Kit from WD features a SATA III 6 Gb/s interface along with a large 2TB storage capacity giving you fast access to a large amount of data. This WD drive is designed for demanding environments where enhanced performance is crucial such as photo and video editing and gaming. With a dual processor and dynamic cache you can rest assured this drive will be there when you need it. The motor shaft is secured at both ends to reduce system-induced vibration and increase stability enabling consistently higher performance. 2TB Desktop Performance 7200 rpm SATA III 3.5" Internal HDD Retail Kit is rated 4.6 out of 5 by 57. Rated 3 out of 5 by Venugopal from They get too hot! I have no complaints about their performance, but they get very hot. Even when operating them in open air, with a fan running, you will see that they get very hot. If you want to put them inside a computer, you better have fans blowing directly onto the drives. I wouldn't recommend putting them in a chassis that doesn't have fans blowing (or sucking) air directly onto the hard drives. The total power consumption, based on the rating on the drive, shouldn't be more than 10W. But the drives feel like they are burning lot more power! Rated 5 out of 5 by startfresh from the best warranty, the most reliable hdd SSDs are great but still too pricey per gig to hold your photos or to act as a backup drive. 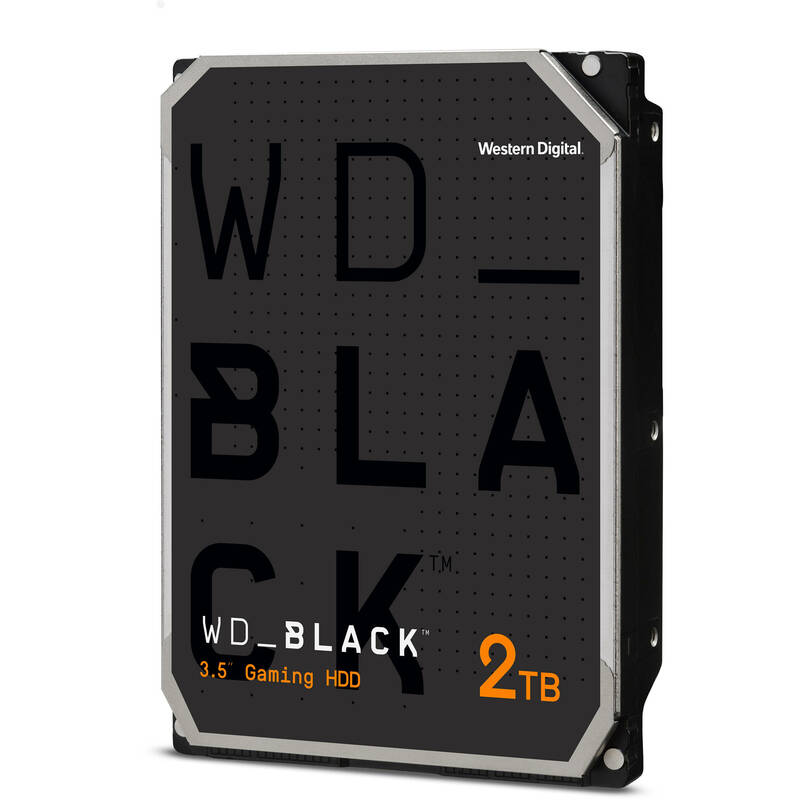 The black WD hdds give the best performance of any reasonably priced drive and have the best warranties, 5 years from the manufacturer. I find that WD drives last basically forever barring physical accidents. An interesting datapoint- Google data centers use ordinary hdds for a lot of their storage and one brand of drive, I read, has a much lower failure rate than others. They won't say who the manufacturer is, but I have to believe it's WD. You don't buy an hdd for speed, at least once you've gotten used to ssd speeds, you buy it to not crash, and in this these drives trully excel. Rated 5 out of 5 by Dakota from The sweet spot in the WD Black series drives Price will always be the most important factor in our purchase decisions. The 2 terabyte WD Black drive is the sweet spot of all the drives as it has an acceptable amount of space (1.8T realistically available) and a great medium price point. But don't forget what else you get with this, faster than average speeds and a FIVE YEAR WARRANTY. Western digital is pretty much saying this drive will not fail you anytime soon. Above all else we need our drives to work and be reliable, and after 5 years we can switch out to new drives for peace of mind. Great price, honestly good speeds, lots of space, very satisfied with my purchase. I use it for gaming and music production (live recording and playback). No issues. It does make normal traditional HD noise as expected. Rated 5 out of 5 by David from Rock solod performance with a great warranty I have been using WD Black desktop drives across two desktops for data storage for several years. I currently have 8 in use. In additon to great performace they are backed by a 5-year warranty, which is the best in this class of drives. All drives, regardless of brand, may (and likely will) fail at some point in time. WD's no-nonense system for replacement makes this drive a great choice. You will pay more than you will for some of their other varieties, but in terms of overall performance, you do get what you pay for. I am not a fan of so-called green drives, which go to sleep when not in use. This can be an issue in situations of heavy use, where instant acess is required at all times. Rated 5 out of 5 by Greg S. from Fast; Quiet; perfectly adequate I have a WD Passport for my MacPro (1T), that I have used for 2.5 years; a WD 4T Book that I have used for 4 years; a 4T WD Elements external drive owned for 1 yr.,? a 2T WD Passport formatted for Windows for 1 yr., and I just bought an 8 TB WD Book on sale for $150, and I have never had a single issue with any of them. I just got this Black because I recently purchased a HP Omen desktop? that has 2 external 3.5" bays, each already wired and ready for a drive. I wanted a 7200 speed because I am using this to store photos and videos. It has a 5 yr warranty also.? I like using SSD, but I could not get the Samsung Evo 850 to fit properly in the external bays and will need to install the 2, 1-TB 850 Evo's on the inside of the desktop. So, the next best thing was to go with the fastest, most reliable product I could find....WD Black. Rated 5 out of 5 by Gman from Good upgrade vs previous Cavier Black model I bought this HD as a replacement for my aging Caviar black that I purchased back in 2009 to use as an external. This first thing I noticed upon powering on the new hd was the low noise level. My 2009 version always made an audible resonance, which required placing a book under it to dampen the noise. This new drive doesn't need it at all. Will this drive work with a Dell XPS 8920 running Windows 10 home? I have a Dell Precision 7910 Windows 10 Pro and Dell XPS Studio 9000 Windows 7 and the 2TB Caviar Black works verywell in both.Have had no concerns. Can this one be used in the Alienware Area 51? Will this internal Hard drive work with my GIGABYTE GA-P35-DS3L Motherboard? I'm upgrading from a 12 year old &amp; still working 320GB Seagate Barracuda ST3320620AS to possibly this WDBSLA0020HNC-NRSN Hard Drive? It will work, they use the same SATA interfaces, and if you are planning to use multiple hard drives in the computer your motherboard should support at least 2 SATA connections. What comes in the retail box...cables? Mine came with the anti static bag only.